WB: MDA-MB-468 and LNCaP whole cell lysates; MCF7 cell lysate. ICC/IF: Human renal tubular epithelial cells; Human nasal epithelial cells; NSCLC cells; Human renal proximal tubular cells; LNCaP cells. 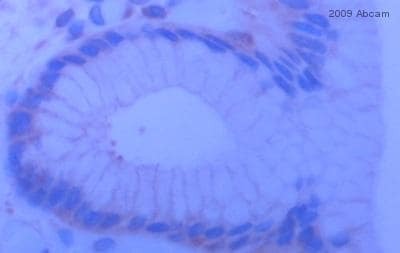 IHC-P: Breast cancer tissue; Human stomach tissue. Flow Cyt: MCF7 and A431 cells. IHC-Fr: Human skin tissue. Abcam recommended secondaries - Goat Anti-Mouse HRP (ab205719) and Goat Anti-Mouse Alexa Fluor® 488 (ab150113). See other anti-mouse secondary antibodies that can be used with this antibody. Our Abpromise guarantee covers the use of ab1416 in the following tested applications. Cadherins are calcium-dependent cell adhesion proteins. They preferentially interact with themselves in a homophilic manner in connecting cells; cadherins may thus contribute to the sorting of heterogeneous cell types. CDH1 is involved in mechanisms regulating cell-cell adhesions, mobility and proliferation of epithelial cells. Has a potent invasive suppressor role. It is a ligand for integrin alpha-E/beta-7. E-Cad/CTF2 promotes non-amyloidogenic degradation of Abeta precursors. Has a strong inhibitory effect on APP C99 and C83 production. Defects in CDH1 are the cause of hereditary diffuse gastric cancer (HDGC) [MIM:137215]. An autosomal dominant cancer predisposition syndrome with increased susceptibility to diffuse gastric cancer. Diffuse gastric cancer is a malignant disease characterized by poorly differentiated infiltrating lesions resulting in thickening of the stomach. Malignant tumors start in the stomach, can spread to the esophagus or the small intestine, and can extend through the stomach wall to nearby lymph nodes and organs. It also can metastasize to other parts of the body. Note=Heterozygous germline mutations CDH1 are responsible for familial cases of diffuse gastric cancer. Somatic mutations in the has also been found in patients with sporadic diffuse gastric cancer and lobular breast cancer. Defects in CDH1 are a cause of susceptibility to endometrial cancer (ENDMC) [MIM:608089]. Defects in CDH1 are a cause of susceptibility to ovarian cancer (OC) [MIM:167000]. Ovarian cancer common malignancy originating from ovarian tissue. Although many histologic types of ovarian neoplasms have been described, epithelial ovarian carcinoma is the most common form. Ovarian cancers are often asymptomatic and the recognized signs and symptoms, even of late-stage disease, are vague. Consequently, most patients are diagnosed with advanced disease. During apoptosis or with calcium influx, cleaved by a membrane-bound metalloproteinase (ADAM10), PS1/gamma-secretase and caspase-3 to produce fragments of about 38 kDa (E-CAD/CTF1), 33 kDa (E-CAD/CTF2) and 29 kDa (E-CAD/CTF3), respectively. Processing by the metalloproteinase, induced by calcium influx, causes disruption of cell-cell adhesion and the subsequent release of beta-catenin into the cytoplasm. The residual membrane-tethered cleavage product is rapidly degraded via an intracellular proteolytic pathway. Cleavage by caspase-3 releases the cytoplasmic tail resulting in disintegration of the actin microfilament system. The gamma-secretase-mediated cleavage promotes disassembly of adherens junctions. Cell junction. Cell membrane. Endosome. Golgi apparatus > trans-Golgi network. Colocalizes with DLGAP5 at sites of cell-cell contact in intestinal epithelial cells. Anchored to actin microfilaments through association with alpha-, beta- and gamma-catenin. Sequential proteolysis induced by apoptosis or calcium influx, results in translocation from sites of cell-cell contact to the cytoplasm. Colocalizes with RAB11A endosomes during its transport from the Golgi apparatus to the plasma membrane. Western blot - Anti-E Cadherin antibody [HECD-1] (ab1416)This image is courtesy of an Abreview submitted by Dr. Armen Petrosyan. Lysates/proteins at 80 µg/ml per lane. 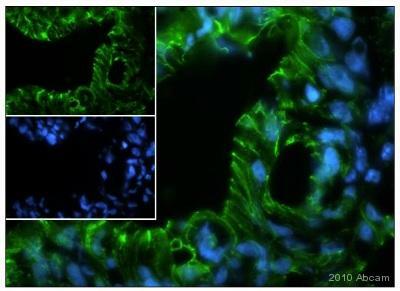 ab1416 staining E cadherin in Human renal tubular epithelial cells by ICC/IF (Immunocytochemistry/immunofluorescence). Cells were fixed with paraformaldehyde, permeabilized with 0.5% Triton X-100 and blocked with 1% BSA for 1 hour at 20°C. Samples were incubated with primary antibody (1/200 in PBS + 0.01% BSA) for 24 hours at 4°C. An Alexa Fluor® 555-conjugated Donkey anti-mouse IgG polyclonal was used as the secondary antibody (1/500). Overlay histogram showing MCF7 cells stained with ab1416 (red line). The cells were fixed with 80% methanol (5 min) and incubated in 1x PBS / 10% normal goat serum / 0.3M glycine to block non-specific protein-protein interactions. The cells were then incubated with the antibody (ab1416, 1/100 dilution) for 30 min at 22°C. The secondary antibody used was Alexa Fluor® 488 goat anti-mouse IgG (H+L) (ab150113) at 1/2000 dilution for 30 min at 22°C. Isotype control antibody (black line) was mouse IgG1 [ICIGG1] (ab91353, 1μg/1x106 cells) used under the same conditions. Unlabelled sample (blue line) was also used as a control. Acquisition of >5,000 events were collected using a 20mW Argon ion laser (488nm) and 525/30 bandpass filter. Please note that Abcam do not have any data for use of this antibody on non-fixed cells. We welcome any customer feedback. ab1416 staining E Cadherin in Human nasal epithelial cells by ICC/IF (Immunocytochemistry/immunofluorescence). Cells were fixed paraformaldehyde and permeabilized with Triton X-100 0.1%. Samples were incubated with primary antibody (1/50) for 18 hours at 4°C. A Cy2®-conjugated Horse anti-mouse monoclonal(1/100) was used as the secondary antibody. 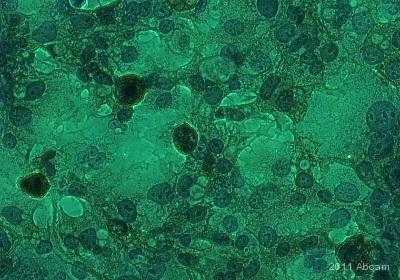 Flow Cytometry - Anti-E Cadherin antibody [HECD-1] (ab1416)This image is ccourtesy of anonymous Abreview. Flow cytometric analysis of A431 (human epidermoid carcinoma cell line) cell line labeling E Cadherin with ab1416 at 1/100 dilution (2) compared with an isotype control (1). 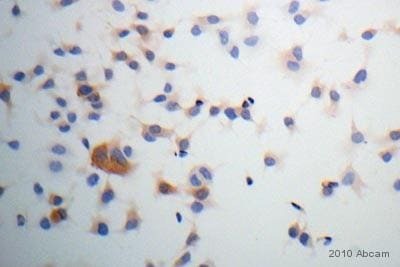 Immunohistochemistry (Frozen sections) - Anti-E Cadherin antibody [HECD-1] (ab1416)Image courtesy of an anonymous Abreview. 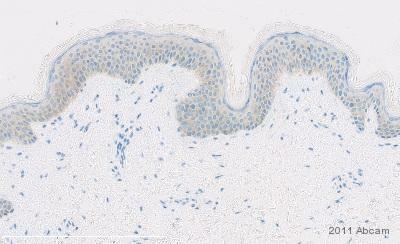 ab1416 staining E Cadherin in human normal skin tissue sections by Immunohistochemistry (frozen sections). Tissue was fixed with acetone. Samples were blocked with 10% serum for 30 minutes at 21°C followed by incubation with the primary antibody at a 1/50 dilution for 30 minutes at 21°C. An undiluted HRP-conjugated goat anti-mouse IgG polyclonal was used as secondary antibody. ab1416 staining E Cadherin in the Human NSCLC cell line by ICC/IF (Immunocytochemistry/immunofluorescence). Cells were fixed with paraformaldehyde, permeabilized with 0.3% Triton in PBS and blocked with 5% serum for 1 hour at room temperature. Samples were incubated with primary antibody (1/100 in 0.3% Triton, 5% Goat Serum in PBS) for 1 hour. 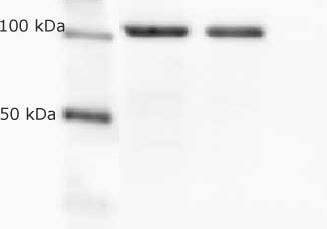 An Alexa Fluor® 555-conjugated Goat polyclonal was used as the secondary antibody (1/500). 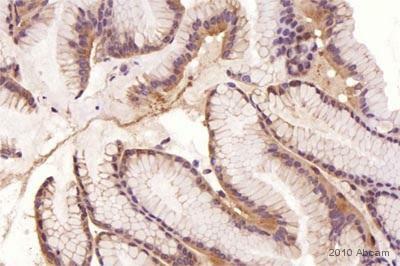 ab1416 staining E Cadherin in human stomach tissue section by Immunohistochemistry (Formalin/PFA-fixed paraffin-embedded sections). Tissue underwent formaldehyde fixation before heat mediated antigen retrieval in Citrate pH 6.0 and then blocking with 5% serum for 1 hour at 23°C was performed. The primary antibody was diluted 1/100 and incubated with sample for 1 hour at 23°C. A HRP conjugated goat polyclonal to mouse IgG was used undiluted as secondary antibody. Immunocytochemistry/ Immunofluorescence - Anti-E Cadherin antibody [HECD-1] (ab1416)This image is courtesy of an abreview submitted by Robert Jenkins. 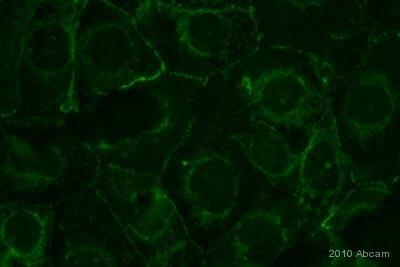 ab1416 staining E Cadherin in Human Renal Proximal Tubular cells by Immunocytochemistry/ Immunofluorescence. Cells were fixed with paraformaldehyde, permeabilized with 0.1% Triton ×100 and blocking with 1% BSA was done for 30 minutes at 210C. Samples were incubated with primary antibody (1/50: in 0.1 % BSA in PBS) for 24 hours at 4°C. An Alexa Fluor®488-conjugated goat polyclonal to mouse IgG was used as secondary antibody at 1/1000 dilution. Immunocytochemistry/ Immunofluorescence - Anti-E Cadherin antibody [HECD-1] (ab1416)This image is courtesy of an Abreview submitted by Dr. Armen Petrosyan. Formaldehyde-fixed, 0.2% Triton X-100 permeabilized LNCaP (human prostate cancer cell line) cells stained for E Cadherin (green) using ab1416 at 1/50 dilution in ICC/IF. Blue: Hoechst 33342 staining. Publishing research using ab1416? Please let us know so that we can cite the reference in this datasheet. Yes - TBS Triton 0,1% 10min.